At Techna-Tool, we know that maintaining tools at the highest level of quality is as important to our customers as it is to us. Worn and damaged tools can deteriorate tolerances and surface finishes. Missing or broken tools can severely hinder machining performance. Our Techna-Check® Tool Monitoring Systems employ state-of-the-art technology to monitor for broken, worn, and missing tools through spindle power monitoring or vibration analysis. And with over 90,000 systems installed for our clients worldwide since 1990, we have assured our place as a trusted resource for metal-cutting customers. In addition to providing time-tested tool monitoring systems, we are proud to supply new and innovative products. 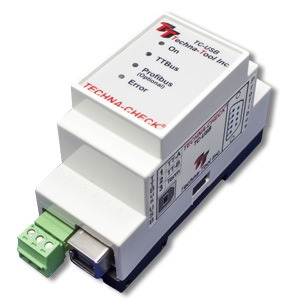 The Techna-Check® model TC-USB is a tool monitoring system that is designed to use our PWM-TTBUS series power transducers. These measure true power on a machine spindle or axis motor, and can be used on standard motors, AC servo motors, and variable frequency drives. The system interfaces with an accelerometer to measure vibrations on a spindle or fixture, verifying that it is within a set range, while the Techna-Check® determines if any tool is dull, broken, or missing. The TC-USB has a host of useful features, including a USB interface for simple, reliable connection to a PC, and the capability to monitor 1 to 128 tools or cutting processes per motor. It has optional Profibus compatibility, a curve enveloping feature for limits, and a touch point limit that is used for grinding and balancing machines. Anywhere from 1 to 20 motors can be connected to a single TC-USB device, offering comprehensive monitoring to ensure that our clients’ machining systems are working at their optimal level. For more information about the TC-USB, or our other high quality tool monitoring systems, please contact us today. You can also provide feedback on Twitter. This entry was posted in Techna-Check Monitoring and tagged Automated Manufacturing Systems, Broken Tool Monitoring System, High Quality Tool Monitoring Systems, Techna-Check Tool Monitoring Systems. Bookmark the permalink.